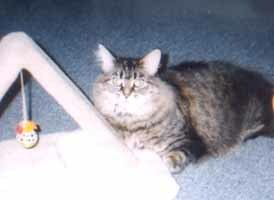 Here's a photo of my adopted cat, "Dora" beside her scratching post, as usual. She loves playing with it, rolling all over the floor, trying to catch the little ball. Dora has adjusted very well to her new home, but residing with me and "Jake" my little male tabby, she is still very wary of me. If the day ever comes that I can pick her up and brush her, I will go out and celebrate. In the meantime I will continue to love her with all my heart.